Welcome to Blaine Auxiliary Communications Service (ACS). We are a group of radio communications specialists who volunteer for the Blaine Police Department to serve our community. Our primary objective is to be always ready to provide emergency communications services for the citizens of Blaine and the surrounding communities in the event of a natural disaster or other emergency. We manage a program of ongoing training for our members and we continuously maintain and upgrade the communications equipment installed in the City of Blaine Emergency Operations Center (EOC) as well as our Mobile Command Post (MCP). In addition, there are many civic events in Blaine that rely on the Police Department to help with traffic management, crowd control, and especially communications. In the City of Blaine, we augment our police force by using highly-trained communications volunteers to handle these routine tasks, leaving the on-duty police officers available to deal with more complex situations. Blaine’s Auxiliary Communications Service (ACS) supports the Department of Public Safety with a team of dedicated civilian volunteers who bring expertise in communications and related technologies, including electronics, radio, telephony and Internet services. The men and women of the Blaine ACS are a critical resource: without the help of its members, the Public Safety Department could not coordinate and deliver prompt services during emergencies and crises that overwhelm normal capabilities. 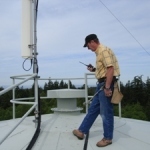 Backup Communications during emergencies: Severe weather events and large-scale incidents sometimes overwhelm normal communications including cell phone, landline telephone, and public safety radio systems. Interoperability: Over a dozen local, state and federal law enforcement agencies work in Blaine. Our public safety personnel interact with them all, and all agencies can be called upon to work together when an emergency arises. Providing back up communications and interoperability were not possible for Blaine’s Public Safety Department until it commissioned an Auxiliary Communications Service unit. 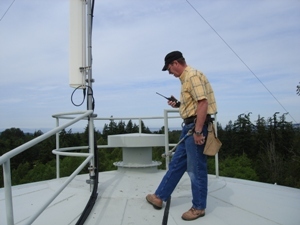 Blaine Auxiliary Communications Service volunteers are now working to equip our radio repeater site and our operations center with improved communications. They have already designed built, and are operating a state-of-the-art communications platform to meet the special needs of interoperable communications in our border city, benefiting several different law enforcement and public service agencies, and the amateur radio emergency communications community. The City of Blaine and the Public Safety Department support ACS efforts with funding for equipment and training whenever possible. 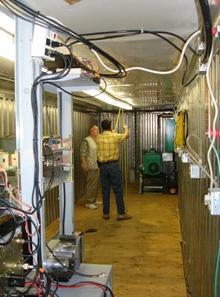 All work provided in building, maintaining, and operating the ACS equipment is volunteered by the ACS members. Over 2,000 hours of volunteer expertise have gone in to putting our communications van on the road.